(LDS News) Before the break of dawn Thursday, hundreds of mourners gathered outside the Conference Center to pay their last respects to President Thomas S. Monson, the leader of The Church of Jesus Christ of Latter-day Saints who died January 2, 2018. The viewing was scheduled to begin for Church employees and their families at 7 a.m., but with the crowds gathering in the cold and intermittent snowflakes falling, doors opened at 6:30 a.m. When the public viewing started at 9:00 a.m., stormy skies had given way to scattered sunshine, and more than 5,500 men, women and children had already entered the Hall of the Prophets and somberly walked past the open casket of the late Church president. By noon more than 10,000 people had come through to see the Church’s beloved 16th prophet and president lying in repose. Ten to 20,000 more are expected by day’s end when the public viewing concludes at 8 p.m. The viewings for most past Church presidents were held in the Church Administration Building, located southeast of the Conference Center. 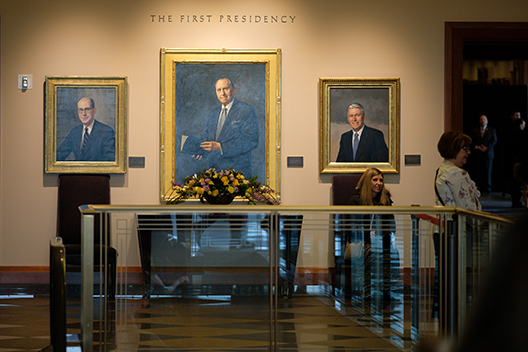 Beginning with the passing of President Gordon B. Hinckley in January 2008, the public was invited to show their love and respect in the Conference Center (built during President Hinckley’s tenure), where there are bronze busts of each of the Church's presidents. President Monson’s funeral will take place in the 21,000-seat Conference Center tomorrow, Friday, January 12, 2018, at 12:00 p.m. MST. The funeral services will be broadcast live via MormonNewsroom.org, mormontabernaclechoir.org, LDS.org (Cebuano, Chinese [Cantonese and Mandarin], Czech, Danish, Dutch, English, Finnish, French, German, Hungarian, Indonesian, Italian, Japanese, Korean, Mongolian, Norwegian, Portuguese, Russian, Samoan, Swedish, Tagalog, Tahitian, Thai, Tongan, Spanish, Ukrainian, and ASL, with closed captioning in English and Spanish), KSL TV, the KSL TV app, BYUtv, BYUtv Global, KBYUtv Eleven, BYUtv International, Mormon Channel, Canal Mormón (Spanish) and on the Church satellite system. In addition, audio broadcasts will air on KSL Radio and BYU Radio.